On the east side of Kyoto imperial palace, there is a shrine called Nashinoki shrine. This is one of the most newest shrines in Kyoto. Nashinoki shrine was established in 1885 (Meiji 18) by the order of Emperor Meiji. It enshrines a father and a son of the nobility in Edo to Meiji period. The father is Sanjyo Sanetsumu (1802~1859) and the son is Sanjyo Sanetomi (1837~1891). Sanjyo Sanetsumu served three emperors, Emperor Kokaku, Emperor Ninkou, and Emperor Koumei. It was a time of huge change of Japanese society. Politics was unstable mainly because of the encounter with the U.S., and people were divided into two groups, the group supporting the shogunate and the group supporting the emperor system. Sanjyo Sanetsumu served emperors and tried to restore practical imperial rules to the society. His son, Sanjyo Sanetomi also supported the emperor system. He was once demoted to outside of Kyoto for 4 years because of his support to the emperor system under the Tokugawa shogunate. However, after the civil war between the group supporting the Tokugawa shogunate and the group supporting the emperor system, Meiji Restoration (1868) occurred and it restored practical imperial rule to the Empire of Japan. Therefore, Sanjyo Sanetsumu and Sanjyo Sanetomi who have surved to the emperor family for a long time were highly valued by Emperor Meiji. This is why Nashinoki shrine established to enshrine them by Emperor Meiji. 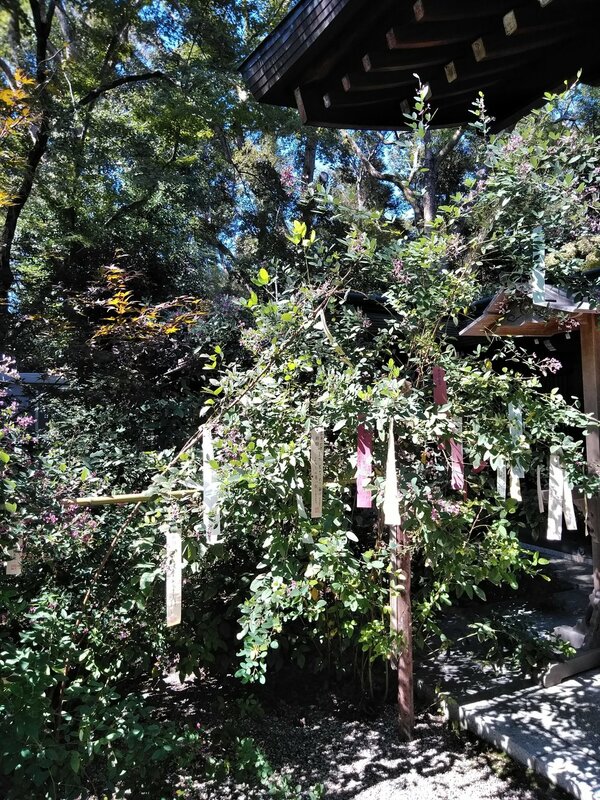 Today, Nashinoki shrine is covered with beautiful green leaves. It is also famous for Hagi, the autumn flower in Japan. You can see a lot of little papers tied on Hagi leaves here. People write their wishes or poems on these papers and tie it on Hagi leaves. Sanjyo Sanetsumu was famous for his academic talent, and Sanetomi was good at drawing and creating poems. Therefore, people pray for their progress of art or scholarship at Nashinoki shrine. There is a well called Somei where you can still get clear water today. This water is said one of the 3 best water in Kyoto, and tea ceremony is held here using this Somei water. 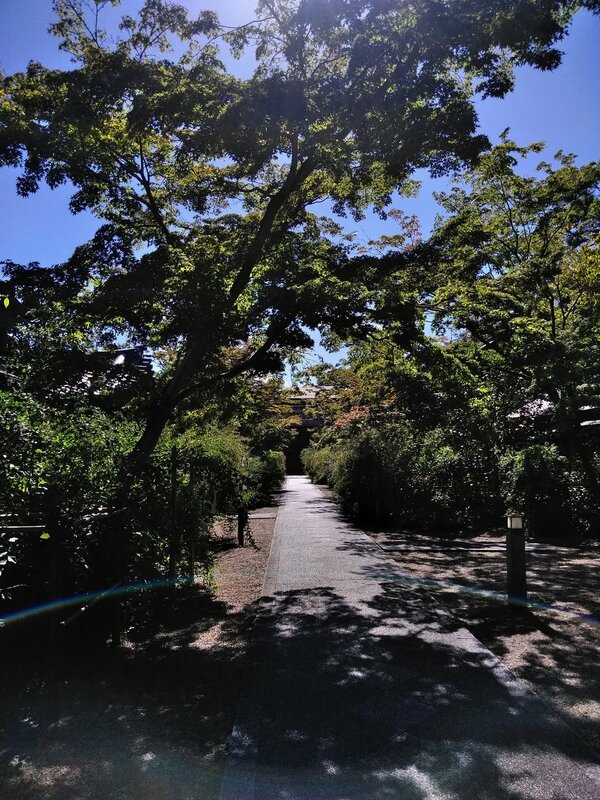 Nashinoki shrine is near to Rozanji, the former site of the resident of Murasaki Shikibu (the author of The Tale of Genji) and Kyoto Imperial Palace. There are several fine Japanese sweets shops nearby. When you visit Kyoto, please visit Nashinoki shrine and the area around it. The area is nice to walk around and feel Japanese history.